Should You Feed Bees Sugar Water? Generally, it is not necessary to feed your bees sugar water. Some people wonder if sugar water is bad for bees. No, it is definitely not bad for bees, but you need to know what you are doing, and you need to know when it might be necessary to help your bees out by feeding them sugar water. If you are setting up a new bee hive, then it is usually a good idea to feed your new honey bees sugar water. 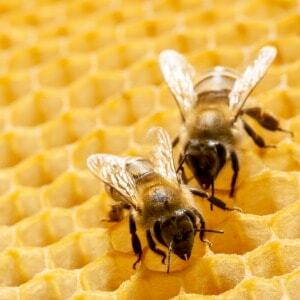 A new colony of bees generally arrives with no food or honey reserves for them to feed off of. It takes time for the bees to gather the necessary pollen in order for them to feed the hive. Sugar water will help get the hive off to a good start. Another reason you might consider feeding your bees is if they were not able to store enough honey to live off of during the winter. You should be able to tell by lifting the hive. One hive of honey bees needs 50-60 pounds of honey to live off of during the winter, or the bees will starve. If, in the fall, you see that they have not stored that much honey, you may want to feed your bees some sugar water in early spring to help get the hive off to a good start during the next year. If you give the bees sugar water in late autumn, this will help give them an extra boost before winter sets in. Beekeepers most often use a 1 to 1 ratio of pure cane sugar to water in making sugar water for honey bees. Place the water and sugar in a sauce pan (e.g. 3 cups sugar, 3 cups water) and heat until sugar is dissolved. Do not boil. After sugar mixture is cooled, it is ready to feed to your bees. 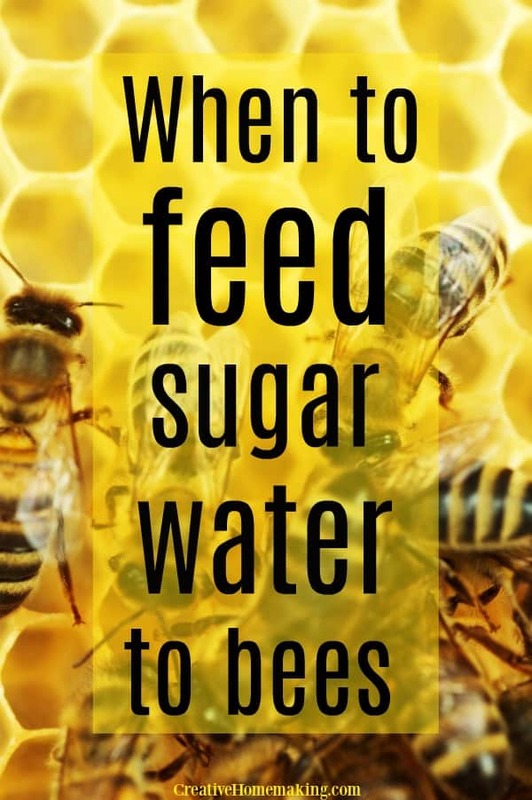 There are several ways you can feed your bee hive sugar water. It is best to use a method that allows you to feed the sugar water inside the hive, as opposed to outside the hive. Sugar water outside the hive will attract bees from other colonies. Some people swear by these entrance feeders, however, and have had good luck with them. The easiest way to feed sugar water to your bees is with a beehive top feeder like this one. If you are not able to purchase a hive feeder, you can easily make one. You can make a hive feeder for sugar water by filling up a gallon sized ziploc bag half full with the cooled sugar water. Remove as much air as possible and seal bag. Lay bag on a flat surface and then gently poke 8-10 holes into the top of the bag, making sure not to pierce the other side of the bag. Place the bag on top of the frames in the hive. Place the bag hole side up, you don’t want the sugar water to drip down into the hive. Make sure the bees have enough room to crawl on top of the bag to get the liquid out of the bags through the holes. If there is not enough space for the bees, then place something in between the lid of the hive and the frames in order to keep it propped open while the bees are feeding. Check the hive every couple of days to see if the sugar water needs to be replaced. When the flowers and trees start providing pollen for the bees to make their honey, it is no longer necessary to supplement the hive with sugar water. If your bees do not have enough honey to get them through the winter and you find yourself needing to feed your bees sugar water in winter, you likely won’t be able to feed them with the sugar water, as the sugar water will freeze. Some beekeepers use dry sugar to feed their bees during cold months of early spring. Lay a small piece of newspaper over several of the bee frames. Place a small amount of dry granulated sugar on top of the newspaper for the bees to feed on. Pollen patties are a great alternative to sugar water for feeding bees. They are very inexpensive, and you can order them online from Amazon. Just lay a pollen patty on top of your frames, right under the lid, and the bees will feed as necessary.